As part of the above-mentioned project commissioned by the Agency for Cultural Affairs (re-commissioned by the Nara National Research Institute for Cultural Properties), we dispatched experts to Myanmar for the fourth time in 2017. Two staff members from the Institute conducted structural behavior monitoring and a survey on traditional building techniques and production systems (from November 25th through December 3rd), while an outside expert tested brick materials (from December 9th through December 12th). 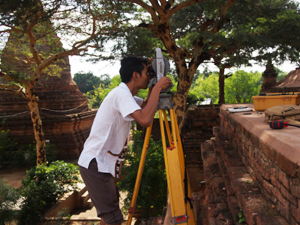 In the structural behavior monitoring checked for the fourth time, no progress was found in deformation of the three monitored historical brick buildings in Bagan in particular. However, many of the resin crack gauges installed on the external surfaces of the buildings had come off due to bird and animal attacks, so they were replaced by metal disks. We also trained the local staff of the Department of Archaeology to facilitate voluntary measurements. Through the hearing survey with local experts who have engaged in restoration of cultural heritage for many years, we exchanged opinions on the details of traditional building techniques and production technologies surveyed in this project while confirming how to produce mortar used in past times and the materials in detail. Since we obtained all materials required for reproduction of this old mortar based on the collected information, we will analyze the mortar sampled from the structures built in the Bagan era in the past survey to compare with the reproduced mortar. We also contacted bricklayers to ask how the restoration work is implemented and their awareness of traditional building techniques and production technologies. At the material testing carried out in a facility of Yangon Technological University in Yangon City, we implemented bending, shearing, and compression strength tests with the prisms (four-layered brick specimens) and mortar specimens produced in the previous visit (September). 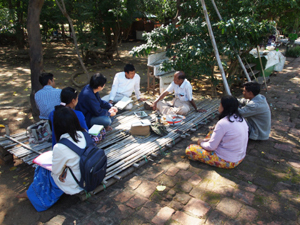 We would like to continually accumulate useful data for better conservation and restoration of the cultural heritage structures in the Bagan area through such surveys.